Tips Request: "General GMing Tips"
Thanks to everyone who submitted their city tips. There's enough for at least another issue, which I'll publish after my holidays in August. Would You Like A Forum To Chat About Each Week's Issue? My other RPG web site at About.com has a forums section that allows both registered user and anonymous guest access. And I'm wondering if any of you would like to use these forums to chat with me and other subscribers about each week's topic and tips? Perhaps you have more tips to share, or you'd like to ask a question about one of the tips, or....? I can start a new thread each week and we can use that to meet and chat. My apologies again for having to send out last week's issue in two parts--the character limit of my new list host caught me off-guard with little time for a "Plan B". In This Week's Spotlight: "Getting Feedback From Your Group,Part 1"
"d20: To Stand on Hallowed Ground"
I try to carefully choose the city name so that the name itself hints at important aspects of the city's people or history. For example, if you want to develop a city of quick-tempered dwarves, "Rage" is a good city name. But, if that's too obvious for you, look at different languages. I like using German for dwarves, so a couple options jump out: "Zorn" or "Taumel". Perhaps the dwarves from Zorn war with the dwarves from Taumel because both the peoples are too hot headed to sit down and talk? I really know I've created good city names when the name fits the people so well that in later adventures, when the PCs are in a tavern across the land and they meet an angry dwarf, they all roll their eyes and mutter "he MUST be from Zorn!" [Johnn: that's a great tip because a good city name immediately catches your players' interests like a good plot hook will. It can often solve the problem of motivating the PCs to stop at a city for the urban adventure you have planned because they'll be intrigued by the name and want to check the place out for themselves. The city is one place you can't "work out the details later". The first thing that needs to be done is a quick Who's Who and an hierarchy of the city's power structure. Now, your PCs might never meet these people, depending on the social level at which they play, but the names of the Mayor (or equivalent), government council, judges, and important employees you should know. Every cop or guardsman does not need detailing. Next, what persons and or groups are there with influence? In a modern campaign that might be the trucker's union, in a fantasy setting the carter's guild. A thieves' guild most certainly in the fantasy setting, and in a large city, several might exist as rivals. Rich people can also influence the government. And don't forget action groups such as the SPCA or Greenpeace. Determine who they are. Religions: do they have a place in the government? What is that place? How many are there and what are their major beliefs? Once you have these things determined make notes as to the relationships between the groups. Are they allies, hostile, indifferent? Does the Lamplighters Guild despise the Streetsweeper's Guild to the point of violent action? Is the rich guy in town in bed with the thieves guild or the mafia? Here is a form for creating a "group", be it a hidden cult or the Loyal Guild of Fishmongers. I have used this for everything from a street gang to a multi-planet corporation. All categories do not have to be filled out and extra can be added. Make the PCs feel like they're in a real city, with everything that that implies. If you're in a fantasy setting, it's easy to give the market street atmosphere, but what about letting the players move beyond that? The worst thing you can do in a city campaign is make your city a generic one. If you even only have interesting locations or local quirks about a few of those topics, I guarantee your players will not only remember them, but you might even get to use them as an adventure hook. When you're in a city, the characters can go anywhere and talk to anyone, and as the GM you give up a lot of control over their environment. In the woods or a small town, it's reasonable that they'll only run into the people they should. In a city, you should *expect* them to go talk to NPCs you haven't created yet. Creating a few stock characters with quirks and small-scale goals ("look important in front of the strangers", "keep my job at all costs", etc.) will help you when they leave the beaten path. [Johnn: a friend and awesome GM, David M, has a great system for NPCs. He creates archetype NPCs for the different categories of people in his campaign, then he pulls out their character sheets when needed and individualizes them on the spot (i.e. adding personality, purpose, quirks, and so on). Create archetypes that aren't too specific and can rarely be used. Another key is to give each archetype a local flavour, according to the city in which they live. For example, guards from one city might be equipped with fine swords, full chain armour, and well-maintained crossbows, while guards from another place might only be given grubby leather jerkins and a club. Frustrated and wishing I was a adventurer/artisan/etc. Avoid attracting the attention of "important people"
Try to attract the patronage of "important people"
If you're running a long-term game in the same place, especially in a city, the things the PCs do should affect the pace of the city. If they've committed a crime they should hear about it from criers/on the radio. If they try to overthrow the local powers that be, they should make enemies or friends appropriately. People of the same social circles in a city tend to know each other, and so the PCs can't really act in a vacuum the way they might when traveling from small town to small town. In the wilderness encounters are few and far apart, but in cities they happen all the time - so often that player characters have no chance to participate in everything. Unless they are street wise, they should have a lot of difficulty even figuring out what is going on - the "country boy in New York" effect. It is easy to get cheated, it is easy to get lost, it is easy to get into trouble. In dungeons, you generally don't have to worry about innocent bystanders. If it moves, shoot it. If it doesn't move, shoot it anyway. The kick in the door mentality is unlikely to prove very fruitful in an urban environment. From: Matt I have found the City Book series from Flying Buffalo filled with descriptions on all sorts of city establishments, along with maps, quests, and NPC personalities. The books are generic and can be used in any game system. I have followed their example and created my own establishments, and when the characters enter a town I just flip through my notebook and pick out what best fits in the town or city. Once an establishment is placed in a certain city, the page is moved to where I keep the information for that city. I sometimes re-use places like inns, but change the name and the people in it. Anyone have any general GMing tips? Rules of thumb, tricks, techniques, or advice? I'd like to flesh out the Readers' Tips Of The Week section with more game mastering tips of a general nature. Currently, I have a few tips to post that are responses to previous issues (thanks for sending those in), but I'd also like to see more "out of the blue" kinds of tips that aren't specifically linked to any particular topic we've covered in the past. I think this would appeal to many subscribers, especially if they haven't been keen on any of the recent topics. So, if you have any miscellaneous tips floating around in your head, send'em on in (don't worry about grammar and such either, just get your idea across and I'll do the rest). Lately I have been cruising eBay and checking out antiques. There are some fantastic pictures of unique items. These make for great inspiration for creating magic items, or they could be used to illustrate an item that the players discover, or already have in their possession. 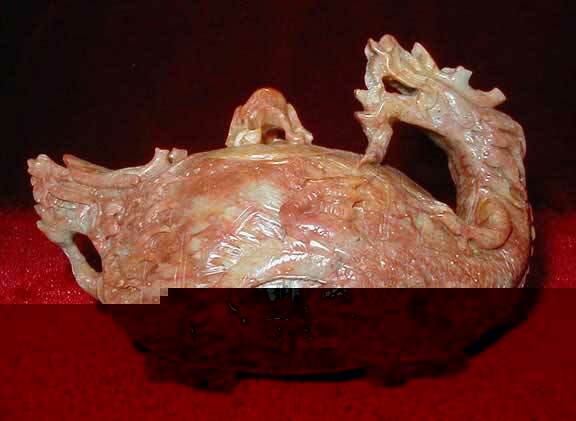 For instance, I am writing up a magic teapot for my local newsletter - it is a Yixing-style teapot, so I went to eBay and searched for "Chinese Teapot" (157 hits) and poked through them until I found one that resembled what I was looking for (a dragon shaped teapot carved out of a streaky red stone). Good tip for finding names: Your High School Yearbook. I used to flip pages and do a blind finger point to a name, then do a second flip and point to get a last name. Same as the manual idea from Tips #82, but just another area to work with. Also a good place is from bands you like. I'm really into the British Heavy Metal band Iron Maiden, knowing all kinds of people from their past and support crew. I once wrote an entire adventure based on the band. I filled my notes with people's names, song titles, song lyrics, and all kinds of Iron Maiden trivia. Now, none of the players got my inside jokes, but I got a kick out of writing it, which made it easier to come up with ideas. The initial idea came from the Somewhere in Time album cover art and voila, instant adventure. Some of your mapping and miniatures tips got me to thinking. I don't think anyone mentioned the endless possibilities offered by cannibalizing other games for parts. Not necessarily other RPGs, but games of other types. Old Sci-Fi and fantasy themed board games like Sanctuary, Dungeon, and the myriad of Star Trek titles are screaming to be pillaged for their character tokens and, possibly, their maps. The best advice you could give gamers in search of cheap maps and miniatures is: check your attic! Chances are you'll find something there. Even if it's only a box of Transformers.